The other day I wrote as a comment to someone else’s blog bemoaning the fact that car magazines don’t write truly long term tests anymore. This morning, I realised on my drive to work that I had the perfect opportunity to right that wrong. So, change of working circumstance (and those of this website!?) aside, here’s my statement of intent – to write an irregular progress report on my new Mazda for as long as I keep it. I bought the car as a means by which I get to work and back 3-4 days per week. I live 65 miles away from my place of work, over a mix of the M1, A43 and B4525 (otherwise known as the” Welsh Lanes”). This journey will form the bulk of the miles that I cover in the new car, but there will be exceptions. Previously, this had been the work of my other means of transport, the much referenced Citroen C6, which has become a little too inconsistent of recent months. Following a pitiful valuation and much encouragement from my family, I have kept “the QE2” as it is known at home, at least for the time being. It feels very decadent and almost ridiculous to me to do such a thing, but I’m managing to keep my frugal tendencies in check. I could have gone for a very grand car on the company scheme, but I made a vow a while ago not to do such a thing as it feels like a level of tie and commitment to an organisation that I just don’t want anymore. And, in any case, I don’t want/ need anything as obvious as a 6-Series GC, I’d rather indulge my interest in something a little more thoughtful. I have thought the new generation of Mazdas rather striking from the outset. The CX-5, then the Mazda6 … by the time that the 3 was launched, it was becoming clear that here was an emerging range that is designed with confidence, cohesion, but with enough differentiation between the models in the range to avoid the “Russian doll” effect so obvious elsewhere. The subsequent Mazda2 and CX-3 have confirmed my opinion of a very nice range of cars that feel like they have been conceived as a whole. Furthermore, I like the idea that there is this rather plucky (that’s the wistful romantic in me), independent manufacturer that has picked itself up from its divorce from its previous US alliance partner, and is making interestingly designed and engineered cars, and somehow, doing it better than before. 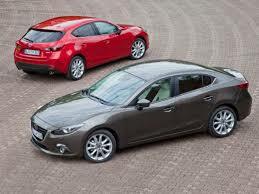 Dare I say that, in this respect, Mazda seems to be succeeding where the likes of SAAB and MG-Rover could not. I’m sure that there are many mitigating circumstances in their respective cases for this, but, from where I have been sat, in the case of Mazda there has been less of the noise and theatrics, and, instead, what looks like a well thought-through plan that has substance and backing. So, the Mazda3 caught my eye and enthusiasm from launch a couple of years ago. When I ventured into a local showroom (conveniently opened in my town about 3 years ago) and picked up a brochure, I immediately clocked a very nice saloon version, which, for some daft reason is labelled “Fastback”. I have not heard the latter term since the days of the Rover 800 “hatch” of the same moniker, so was immediately confused. Anyway, I am a sucker for a small (actually, it is not that small) saloon, and quickly honed in on it as something of significant intrigue and potential. It is interesting when this happens as, sub-consciously, one then finds oneself noticing them on the road. The saloon is clearly outsold significantly by the hatch, but there are quite a few about on the roads, and I found myself liking them, albeit I noticed that spec was quite important as the design needs the larger wheels and is well set off by the small rear lip spoiler that sits on the boot – these only come with the top, “Sport Nav” specification. See how the mind creates its own configurator … In the brochure “Titanium Flash” caught my eye as an interesting colour, although for a long time I did not spot one in that colour out there on the road, and I think that I might be in a Lib-Dem scale minority on that one. 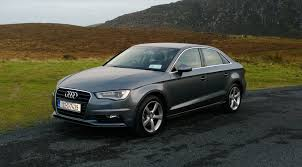 Audi A3 – Very Nice! Obviously, I looked into alternatives, such as the A3 saloon (which I admit to liking enormously, especially from a styling perspective, but a like-for-like spec would cost c.£8k (or some 33%) more, and it does not tickle my “alternative” predilection), the Jetta, the Mondeo (to which I gave a lot of thought, but it’s bigger than I wanted this time, and is a hatch only apart from the hybrid), the Mazda6 (nice, but too big), and the KIA Optima (of which I very much like the looks, but rejected having sat in and driven one). The fact is that there aren’t that many “small saloons” out there. And, as mentioned earlier, the Mazda3 is not that small at 4,585mm in length; my old 4th generation Subaru Legacy (supposedly from the class up) was only 4,729mm. If I am honest with myself, I think I had become positively prejudiced towards the Mazda by this stage, and still (post purchase) find myself casting admiring glances at a colleague’s dark grey A3 saloon, albeit whilst noticing that his is one of about eight A3s of a dark shade of grey/ black in the car park outside. Anyhow, the time came about 6 weeks ago when my wife gave the nod to putting the C6 into semi-retirement (as it turned out) and about a nano-second later I was at once on the ‘net to confirm my preferred colour/ spec and also see what might be out there that was “nearly new”. I quickly found cars in the preferred spec that were “pre-registered” at attractive prices, including one in Titanium Flash at a dealership about 15 miles away … it seemed like fate. The only thing missing was leather seats/ trim, but I considered for all of 30 seconds before deciding that I could cope with that. And so, I find myself with a not-quite new Mazda3. I’ve already covered over 1,500 miles in it over about 4 weeks, and am thoroughly pleased with my purchase thus far. There are three areas I can identify thus far that are weaknesses, and I’ve mentioned elsewhere that I find myself subjected to an astonishing level of brand-snobbery about my choice of car … but, there’s a raft of good stuff and it’s a very engaging and fun car to drive. But, I’m at risk of giving away the plot of what I expect to be my next instalment in that I’m anticipating writing more of a “Road Test” next time. I’ll look forward to hearing more. I admit to being a bit tardy in noticing the way that Mazda’s range had subtly consolidated itself into something quite impressive and, as you suggest, something with substance. The car that the 3 reminds me most of is the Alfa Romeo Giulietta, but it’s a sign of how much things have changed that, without having driven either, my assumption is that the Mazda will be better in most respects. Superficially, it suffers from the general malaise of a rising waistline and dropping roof which makes the idea of being a rear seat passenger feel a bit second class – it certainly was the case in the Giulietta I sat in the back of – so I’d be interested in hearing the opinions of any other Robinsons who travel in the car! Sean, I will cover the “view from the rear-seat” in a later piece, but you are right in your perspectives in that the rising waistline is not well appreciated by my daughter (11) in particular. It’s made worse by the curse of the privacy glass (which is amazing hard to avoid these days), and, as a whole is one of the three areas of weakness that I mentioned. If I had felt that the Mazda was going to be a prime source of family motoring (which is our Xsara Picasso, and the C6 on “Sunday afternoon trips”), then I would not have bought it. As I expect the rear seats to be used only occasionally, it’s an acceptable compromise. These are a popular choice in Ireland – I see quite a few on my trips home. Without numbers to back it up, I’d assert the ‘fastback’ outsells the hatch about 80:20 – a much higher proportion than that of the competing Focus or Astra, which have a more 60:40 split(hatch vs saloon). A very attractive looking car in the metal – although I never felt they resolved the front numberplate arrangement to my satisfaction. Look forward to hearing how you get on with it SV. I agree re the number plate – I actually think an Alfa-style placement to one side of the front grille would have made for an amusing and bold solution. While I must admit that the current Mazda range is very consistent and well-made in it’s design, I’m still not particularly fond of it. I find the style too much fashion-dictated with its curvy lines and small windows. I also notice a distinct RWD proportion flavour in most models (even the compact hatchbacks) which seems to appeal to the majority of drivers, but looks wrong to my eye. One has to say however that Mazda is extremely successful with this. The current models can be seen frequently on the roads, and my feeling is that they outsell all other Japanese brands in our area. There’s an interesting line of thought/ debate here about the strong sculpturing of the side panelling and the lack of depth to the side windows. There can be no disputing that they are a victory for form over function and do not make the car an attractive proposition for rear passengers. I will be covering my own thoughts on the styling at some point, which I obviously like overall, but which I think in some cases has been designed to disguise some engineering and packaging challenges, as well as fitting in with the company’s design language, which itself is being dictated by long term building of brand equity. Great to see both short and long term reviews on DTW. I often wonder what I would go for if I was in the same situation, of having to choose a similarly sized vehicle for everyday use and long term ownership. I like to think the Mazda 3 would make the shortlist, although for me right now it would more likely be a toss up between a Honda Civic Tourer or a Golf SV. I’m really looking forward to reading more about your experiences with the Mazda 3 saloon. I’ve always preferred the four-door Mazda 3 to the hatchback, which has (until the current car at least) seemed a bit awkward-looking in comparison. Mazda are doing very well in Australasia as a mass-market brand, so it will also be interesting reading how you find the ownership experience of what I guess is more of a niche brand in the UK. i still remember seeing the three amigos of motoring light entertainment tv collectively gobsmacked when having to declare in front of a braying herd of rightminded British folk that the first Mazda 6 (by then a consistent bestseller here) was actually not bad. Y’know, for a Japanese car. I guess it depends on which side of the world you live on.